5 Tips for Fun Festivities - The Mortgage Place, Inc.
Make your next barbecue, tailgate, school sporting or outdoor event easier with these great tips. Pack properly: Pre-chill beverages, then add cans and bottles to the cooler bottoms and cover them completely with ice. Place food containers on top of the ice layer; top off with ice so no warm air can enter. For hot drinks, pack separately in an airtight insulated thermos. Goodies in, garbage out: Bring your clean cookware and dishes in a plastic tub. When you're ready to go home, line the tub with a garbage bag and put all the dirty dishes inside. Breakfasts of champions: For early morning events, serve a breakfast that doesn't require dishes; pancake-wrapped eggs and bacon or breakfast burritos are perfect. 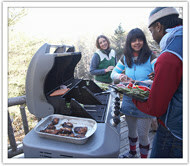 Everyone knows it's windy: Minimize too-fast charcoal burning by pointing the underside grill vents away from the wind. Gas grill? Point perpendicular to wind direction. Goofy goodies: Bring a basket filled with party favors for friends and children: temporary tattoos, beaded necklaces, bracelets and bandanas to match the theme of the party. "In October of 2012 I purchased a home – a very big step for me as a recent widow. Joanne went above and beyond with her advice and commitment to get me the best interest rate available. I could call her or email her day or night and she would always respond promptly. I would ( and have) recommend her to my friends, family and associates. Joanne is very efficient, professional and a sincere pleasure to work with." Copyright © 2012 The Mortgage Place, Inc. All Rights Reserved. Website Design, Hosting and Management by Hound Dog Graphics. The Mortgage Place, Inc. is a registered mortgage broker with the NYS Department of Financial Services. Loans are arranged through third party providers. NMLS#872824.